Can’t I Just Get Dentures? Encino Dental Studio Blog Can’t I Just Get Dentures? 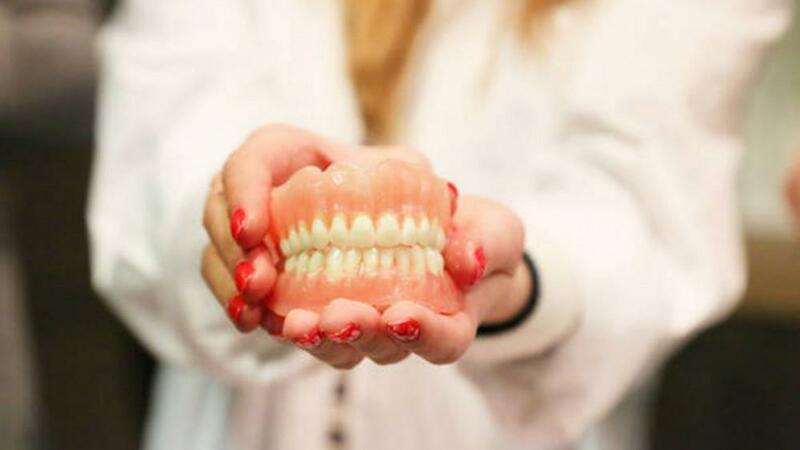 The Fit: No matter how well we get impressions, or what a great job the lab does making the prosthetic, a denture will never feel the way natural teeth do. Depending on how young you are when you get them, you’ll need to replace them every several years. Slip and Slide: Unless you have a great fit or use an adhesive, the denture will move around some when you’re talking and when you’re eating. It can sometimes be messy or noisy until you get used to them. Messy Cleaning: Of course, you have to brush the teeth side of the dentures. You also need to clean the surface that sits next to your gums. While dentists recommend overnight soaking, most people don’t do that frequently, which means that bacteria can grow and thrive in the environment between your denture and your mouth. While implants can be a more involved process, the prosthetic is a higher quality, better fitting, and more natural looking resolution for missing teeth. With dental implants, the fit is like every other tooth in your mouth. You will care for them like the rest of your teeth, brushing and flossing daily. They won’t cause any unusual noises while you eat or talk, and they won’t move around. While implants may be a little more expensive than dentures, they are worth the investment. Call Encino Dental Studio today to find out if implants or implant supported dentures are the right option for you!